SAN JOSE -- Vice President Al Gore today unveiled the Gore 2000 website -- www.algore2000.com. "I am pleased to announce the launch of my campaign website," Vice President Gore said. "It is interactive, informative, and inclusive; kid-friendly, easy-to-use, and functional. I hope Americans of every age will take advantage of this as an easy way to participate in the campaign." The Internet is revolutionizing the way we communicate and share information and it is changing our political life, offering another way for people to connect with each other and with their elected leaders to share ideas and concerns. This website embraces that revolution. It will grow and expand with our campaign. The Gore 2000 website is truly interactive. It opens a two-way dialogue between the Vice President and the American people, young and old. 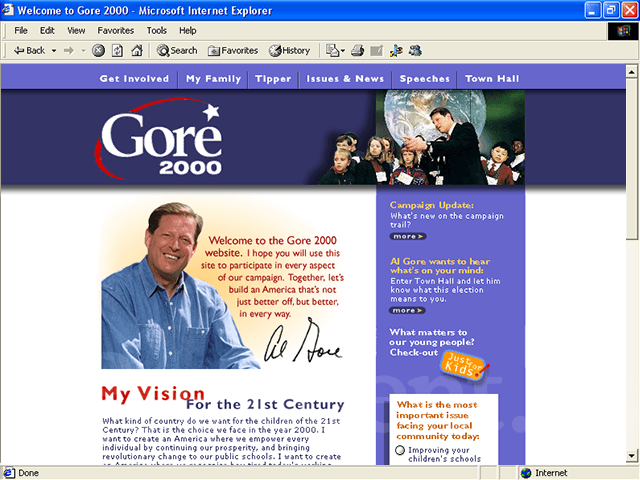 It encourages people to participate in the Gore 2000 campaign and register their opinions on the issues they care about most. Children and adults will be able to ask questions of the Vice President, share their ideas, their photographs and artwork. The Gore 2000 website also includes features that will make volunteering easy to do. As the campaign grows, the website will provide useful information on where people can go to help out and how they can express their support for Al Gore. The Gore 2000 website is comprehensive and informative. It offers information on the Vice President's life, his family, his accomplishments and views on the issues, speech texts, and more to allow voters to learn more about Al Gore, his record and his vision for America in the 21st Century. The Gore 2000 website is the only current presidential campaign website with a kid's page. This will help young people learn about the campaign and the electoral process in a fun and easy way. The Gore 2000 website takes into account the wide range of hardware and software in use by Americans all across the country. Most of us aren't experts with high-powered computers. This webpage is for you. It is designed to work on all systems, not just high-end computers with powerful Internet connections. The Gore 2000 website reflects the degree to which the Internet's exponential growth has impacted the political process. More people are using the Internet to get news and information about political candidates than ever before. Our site is designed to keep the voters informed on Al Gore's views, update them on campaign activities, provide up-to-date campaign news, and have the ability to know more about the campaign than ever before.